NEW for 2009: More Choices and Better Prices! Further description: Ball Home Canning Basics Kit - Let Ball� show you how simple home canning can be. The Ball� Home Canning Basics Kit will give you all the basic utensils you need to start preserving the bounty of your garden or supermarket. Our enameled steel, 21.5-quart liquid capacity water bath canner. The canner rack that holds seven (7) quart jars. 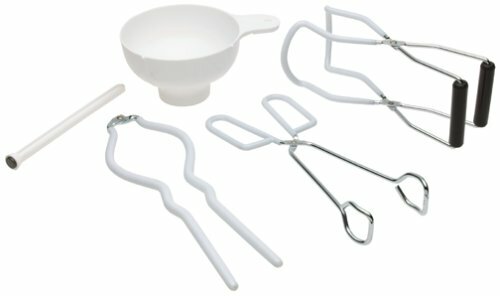 Our Home Canning Kit with lid lifter, canning funnel, jar lifter, jar wrench, and kitchen tongs. Canning Lid Sterilizer - an essential canning tool that provides a quick and easy way to sterilize your canning lids. Our jumbo enameled steel, 33-quart liquid capacity water bath canner. The canner rack that holds nine (9) quart jars. Our large enameled steel, 22-quart liquid capacity water bath canner. Dimensions: 12.5" bottom diameter, 9.75" tall (without lid). Water bath canners are great for processing jellies, fruits and other high acid foods. The manufacturer does not recommend this canner for glass or ceramic top stoves as it does not have a flat bottom. However, our experience is that these canners work fine on "most" flat top stoves. Blake's rating: I notice that this one has handles that are screwed on rather than spot welded. #1 would probably last longer. Home Canning Kit contains all the essential canning tools in one simple kit. The Home Canning Kit contains a convenient Lid Lifter, Canning Funnel, Jar Lifter, Jar Wrench, and Kitchen Tongs. These items can also be purchased separately. These are great tools for water bath, steam, or pressure canning. Our Home Canning Kit is also a great compliment to our Water Bath Canner our Steam Canner and our various Pressure Canners. There are several manufacturers of pressure canners. The two leading ones are Presto and All American (Wisconsin Aluminum). They are more expensive than water bath canners, but they are extremely well built - I bought mine in 1988 and it still looks and works like new! This (through this link) is usually about �79. 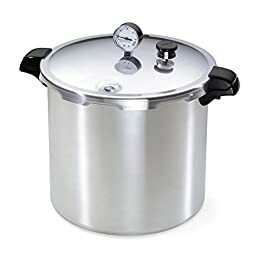 (which is a GREAT price for a pressure canner). There is also a 16 quart version for about �69. Click on the links at left or above for more info and current pricing. Click here for more information about this pressure canner! Available in many sizes, from 10.5 quarts, 15.5, 21.5, 25, 30 and 41 quarts; which hold up to an unbelievable 32 pint jars! Prices range from about �189 to �399; but these are the Rolls Royce's of the home canning world, last a lifetime and can crank out serious volumes! Buy quality canning helpers. These provide the home canner with the essential tools needed for safe and efficient home canning. Price: �8.95 & eligible for FREE Super Saver Shipping on orders over �25.